When my husband Carlos and I have people round or throw a party, we serve empanadas: beef, chicken and cheese. 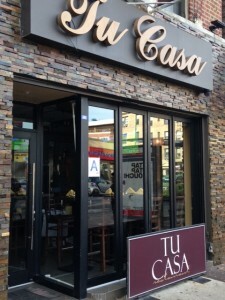 But when guests ask if we made them we have to confess we ordered them – from Tu Casa at 30-10 Steinway Street, just round the corner from 30th Ave. They’ve become an expected feature at our place and are way better than any we could make. Recently I spoke with Rodolfo, Tu Casa’s manager. He has been in the restaurant business in New York for 20 years. “We’re unique,” Rodolfo says. “I believe we are the only Latino restaurant around here. And not only Latino – but quality, good class Latino. The majority of people here in the neighborhood are European – and the majority of the restaurants are like French, and Greek. While Tu Casa’s owner has Dominican and Honduran parents, the chef is Peruvian – and about 75% of the menu is Peruvian. But there are also dishes from other parts of Latin America. Their busiest times are Friday and Saturday nights, though they also serve food at lunchtime and have some regulars who come every day. During the week, Tu Casa has a happy hour in the early evening. The first Tu Casa opened in Kew Gardens. 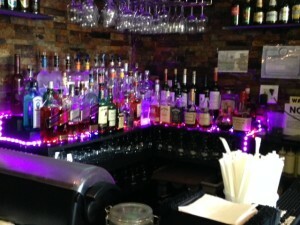 Then came the Astoria restaurant in 2010, and just a few weeks ago the third one, in Forest Hills, opened its doors. Rodolfo says that as manager of the restaurant he enjoys dealing with people – whether it’s staff, or customers – and resolving situations that come up. His aim is to make sure that people who come through the door feel like they are welcome and at home. The restaurant is called “Tu Casa” after all.